The Sustainable Urban Design Academy (SUDA) career pathway opens the “FabLab” to provide students with hands-on STEAM design-build learning connecting Making to Careers. 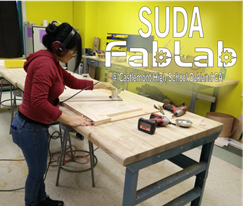 January 21st, The Sustainable Urban Design Academy (SUDA) at Castlemont High School in East Oakland is proud to announce the Grand Opening of our “FabLab” or fabrication laboratory; the first of its kind at an Oakland High School. We will be joined by both Oakland Mayor, Libby Schaaf and District 4 City Council Member, Anne Campbell Washington will join us for the opening. Other key educators and administrators have been invited as well. The SUDA FabLab is a hands-on STEM learning environment that promotes creativity, innovation and independent learning while teaching principles of design, engineering and manufacturing. The Lab also acts as a bridge to connect Castlemont students to a newly developing Central FabLab at Laney College. The SUDA Fablab provides hands on STEAM (Science Technology, Engineering, Art, and Math) linked learning through the use of advanced and digital manufacturing machines and programs. Students explore design-build projects using traditional hand and power tools along with 3D printers, laser cutters and CNC routers among others. What: Launch of unique “FabLab” and showcase of student projects demonstrating skills in STEAM linked learning. When: Wednesday, January 21st 2-4pm. Light refreshments will be served. Why: Digital and advanced manufacturing and design is a rapidly developing career field in the Bay Area, nationally and internationally. The FabLab develops students’ technical and academic skills through hands-on design-build projects in order to prepare students for this growing industry and community need. About SUDA: SUDA’s mission is to: “Empower students through a highly rigorous, engaging and supportive learning environment to graduate prepared for college, career and life as designers and leaders of movements towards a sustainable and just world”.